Upholstery Tools, Stair Tools, and Detail Tools Galore ! So, you need a hand tool. The problem is there are so many tools out there. How do I choose the right tool for me? We can help guide you to the tool that fits your individual preferences. Upholstery Tools: The most common type of hand tools are upholstery tools. Many professional carpet cleaners use the standard upholstery tool for cleaning both furniture and stairs. The angle of the head is usually ideal for the carpet cleaner's hand and body to move back and forth on furniture. Detail Tools: The detail tool is basically an upholstery tool with a more angled head. This more angled head allows easier "detailing" by getting harder to reach areas better. There are a variety of detailer type tools out there that come in different shapes and sizes. Stair Tools: The stair tool is designed to clean stairs easier than other hand tools. Most stair tools have a larger head, a larger handle, or both. 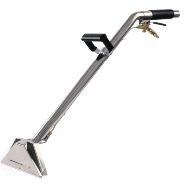 The larger stair tool allows the operator to "bend down" less while cleaning stairs. The larger head cleans the stairs with less passes. There are even more advanced stair tools that swivel to allow the operator to clean the riser of the stair without having to twist the wrists and arms. Open, Closed, or Internal Spray: You will hear options like Open Spray (also called external spray), Closed Spray, and Internal Spray hand tools. Open/External Spray tools have the jet open (see picture on the left). The jet sprays and there could be some overspray. Closed Spray tools have a separate chamber built into the hand tool that prevents overspray (see picture on the right). Notice the jet of the closed spray tool is inserted into the second chamber. 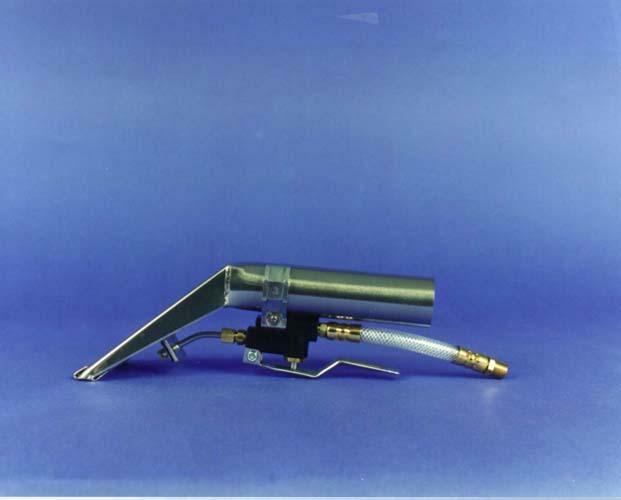 An Internal Spray tool only has one chamber. The jet on the internal spray tool is inserted into the vacuum chamber of the tool. This prevents overspray like the closed spray tool; however, the spray fights against the vacuum in the tool and also opens up possibility of suction loss because of the whole cut into the vacuum chamber. Valve Size: When shopping for hand tools, you will see a psi rating. This rating does not tell you what psi you will be using the tool at. Remember, the tool doesn't control your psi... your machine does. The psi rating is the rating of the valve. Example: a V300 (300psi) psi valve is good for use up to 300psi. Anything over 300psi may damage the valve. When using a hand tool, most operators are not using high psi. However, make sure you choose a hand tool that will be sufficient for your needs.